The guys at X-bit labs have tested the Accelero XTREME 5970, the new VGA cooler from Arctic Cooling, the Switzerland-based VGA cooler maker. 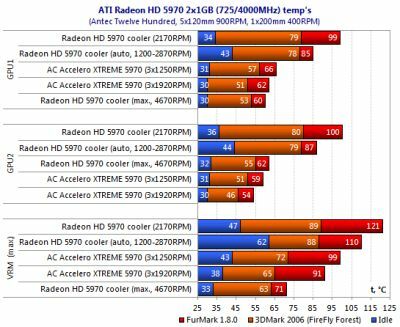 The cooling system of the dual-processor ATI Radeon HD 5970 has the same problems, being only quiet in 2D applications but loud and not very effective in 3D ones. Moreover, it is designed in such a way that the air flow cools one GPU first and then, having heated up, moves to the other GPU, the difference between the temperatures of the two graphics cores amounting to 10° and more as the consequence. 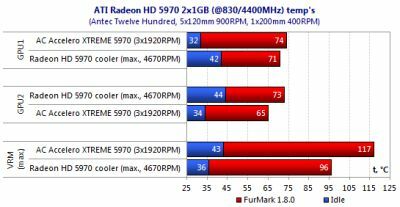 The problem of cooling is less urgent for an ordinary user who runs his graphics card at its default frequencies but this difference in temperatures may prevent an overclocker from accelerating his dual-processor HD 5970. The Switzerland-based Arctic Cooling has addressed the issue by releasing a new cooler called Accelero XTREME 5970. But due to a too large VRM heatsink, the main heatsink of the Accelero XTREME 5970 presses against the tall VRM heatsink and bends the PCB. Failed design. The PCB bending is quite noticeable, IMHO, although not fatal for the continuous board operation, I guess. thats one epic fail right there..id stick with the stock HSF at max..the VRMs will be cooler..and lookin at the graphs, the Accelero doesnt really do what it was designed for..
the only advantage this has over the stock HSF is the lack of noise! I have the impression with the time the cards are bigger, louder and hotter… that’s what I call progress ! each gpu overclocked to 950 mhz and 5ghz gddr5 on aircooling it’s pretty amazing during summertime …. vcore upped to 1.25 and vdimm 1.1 to 1.15V thx to atiovervoltage . it’s still stable during 24/24 crunch on boinc…average ambient temp to 25C in PAris Fr. performance are better than ares or toxic 5970 ….but the gfx cost me only 460 bucks in france . great piece of hardware on my antec twelve hundred supplied with tougpower 1200W . This HSF is installed with 3/4 of the screws attached to the PCB (relative to the stock HSF). Torquing them to much WILL result in results found in this review; however, if careful to not increasing load per screw to 120-125% > stock, then the conclusions found above are NOT replicated. Running FurMark on my 5970 with installed cooler ends in MUCH, MUCH better results than listed here..it’s night & day, honestly. Basically I just purchased this cooler and everything is fine as the card will not bend if you do it according to the manual and put back the backplate as required. It supports the whole card evenly and does not bend it in any way. Before publishing such falsely composed things think a bit.